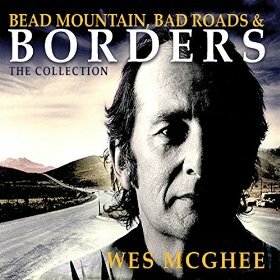 Bead Mountain, Bad Roads and Borders is something of a behemoth; a collection of 30 studio and 16 live tracks by Wes McGhee who is as Texan as they come, except he's from Leicester. He was travelling to Austin a decade before the annual March pilgrimage and has a sound as synonymous with the flatlands as Hancock, Ely and Gilmore. The first three tracks of CD1 tell you everything you thought you knew about McGhee; steel guitar, fiddle, horns, harmony vocals and Wes on a multitude of guitars. Most people would have put their feet up after recording How Do We Get There From content in the knowledge that they have recorded a classic. It's when you get to No Angel On My Wing replete with a Baker Street-esque sax solo and the slow blues of Heartache Avenue you realise that McGhee was prepared to stray from the Bad Roads that he could easily navigate. Whether he should have is another matter though as what I really want to hear is tales of senoritas, cantinas and tequila south of the border. That sound is perfectly encapsulated in the 7 plus minutes of Monterrey. Maybe it's Ponty Bone's accordion, maybe it's the Trumpets of Patty Vetta or maybe the uncredited castanets that make it a song as perfect as you could possibly imagine. This collection could have had a hard prune; eight or ten studio tracks plus a couple of live cuts would have given you the best of Wes McGhee, but I'm glad I've heard the soulful and the bluesy stuff. True, I'm not as keen on that side, but only because his border guitars and honky tonk floors are just so special.